TOKYO, JAPAN, June 26, 2017 --- NTT DOCOMO, INC., will launch a new prepaid SIM service called 'Japan Welcome SIM TM ' that will allow foreign travelers to access the Internet through the DOCOMO network during their stay in Japan, starting July 1st, 2017. Travelers can apply for the service online via a dedicated website prior to leaving their home country and retrieve the SIM card from a location such as Narita, Haneda or Kansai International airport upon arrival in Japan. The SIM card, available in regular, micro and nano formats, provides users with access to DOCOMO's network for 15 days and is compatible with smartphones and tablets without the need for APN settings. DOCOMO will be offering three 15-day plans as part of this service, including Plan Zero, Plan 1000 and Plan 1700. Plan Zero (available from Oct. 2017) will allow users to access the Internet for free at 128 Kbps in exchange for viewing a certain number of video advertisements and filling out a survey prior to arriving in Japan. At ¥1000, Plan 1000 will give users ad-free access at 128 Kbps, while paying a further ¥700 for Plan 1700 will provide increased download speeds (up to 682 Mbps) for the first 500 MB used. Users can continue to enjoy high-speed access by recharging their SIMs for an additional ¥200/100 MB or ¥700/500 MB (prices excluding tax). Alternatively, users can recharge their SIMs for free through a variety of methods such as watching video advertisements and filling in surveys. 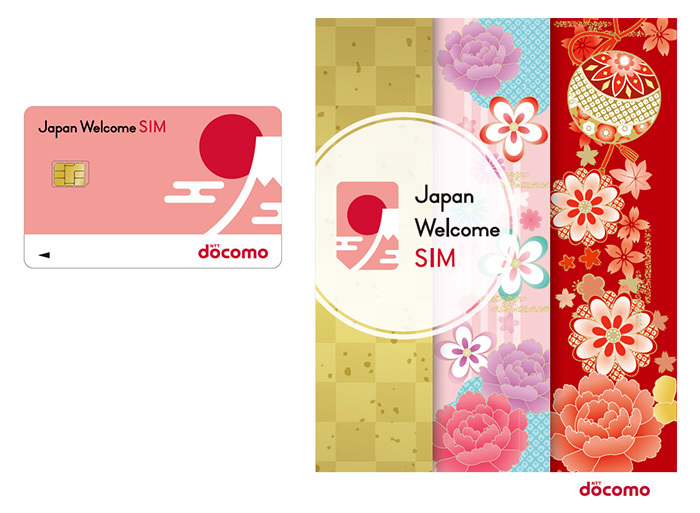 As part of DOCOMO's "+d" initiative to create new value through collaboration, DOCOMO partners will be able to sell the 'Japan Welcome SIM' to foreign travelers visiting Japan in conjunction with their own services. This B2B2C service will initially be offered in partnership with Tokyu Hotels and Booking.com, with DOCOMO looking to gradually expand its partner base moving forward. Partners will have the choice of a 'set offer' or 'count free' service. This will allow companies such as hotels, travel agencies and airlines to sell the 'Japan Welcome SIM' together with their own accommodation and tour plans. This service provides high-speed data to customers of partner companies while disregarding data volumes, when the partner company's web services or applications are used. With an increasing number of travelers visiting Japan ahead of the year 2020, DOCOMO is striving to support foreign visitors as well as businesses with services directed toward inbound tourism. The 'Japan Welcome SIM' initiative is just one of the many ways that DOCOMO is creating a more comfortable environment for all visitors to Japan.